A house sits on the market forever, and it doesn’t get sold. You see an agent’s for sale sign sitting in the yard for months and months. And then, all of a sudden, another one appears. Sometimes, the new agent will get the house sold. But sometimes, no matter how many different agents list the house, it just never sells. You’ve been watching that house “expire”. That is industry-speak for when a house doesn’t get sold during the time frame an owner has a listing contract with a particular real estate agent. When a listing expires, it’s not uncommon for the owner to hire someone new to list their home…figuring the first real estate agent just didn’t have what it takes to get their home sold. But, it usually isn’t the agent that was the problem. There are a few common problems that cause a house to expire. However, it almost always boils down to one specific issue…and one specific solution. So, here’s a list of the typical problems that lead to a house “expiring”, so you don’t make the same mistakes when you sell your own house. We’ll end with the one that is the overall problem and solution. You can’t sell what people can’t see. Sometimes it just boils down to buyers being unable to get in and see the house easily. Some homeowners make it too difficult for buyers and their agents to come in and view the home. It’s fine to have some limits. But if a homeowner requests that all buyers give 24-hour notice, and will only allow the house to be shown on Thursdays between 11:30AM and 2:23PM, that makes it pretty tough to go see. The maid is on permanent vacation. It can be tough to keep your house spotlessly clean while it’s for sale. People wake up and run out of the house for the day having left some dishes in the sink, or beds unmade. That happens. It isn’t the worst thing in the world. But some houses are just a mess. Buyers and agents come in wondering how anyone lives there, or even lives like that. There’s stuff everywhere. It smells. No matter how much imagination a buyer may have, it’s hard to truly look at a house that’s extremely cluttered, or downright dirty, and picture themselves living there. The location of a house might just be undesirable. If a home is located on a main road, or under power lines, or train tracks…or across the street from a firehouse…it can be harder to sell and may take some time for the right buyer to come along. 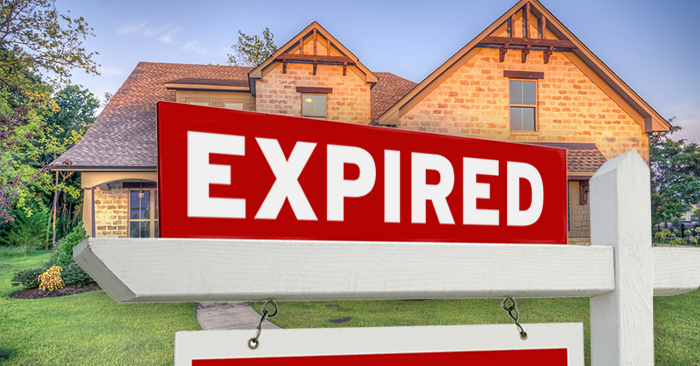 If the market is “slow”, or a “buyer’s market”, it isn’t uncommon for houses to expire. Sometimes it’s just a simple matter of supply and demand. If there are a lot of houses on the market, and only so many buyers buying, there’s only so much you can do. Sometimes it’s just a matter of buyer preference. A house could be easy to show, clean, and priced well against the competition. But if there’s only one buyer for ten houses that are equal in appeal and priced similarly, there’ll be nine disappointed homeowners, and one happy one. That buyer may have just chosen the house they chose because they knew someone who lived on that street. Or liked the paint color, or layout a little better. There isn’t much a homeowner or agent can do about this. It could just be that the real estate agent (or agents) the homeowner hired stink at selling houses. That could be the case. But that usually isn’t really the problem. And another agent usually isn’t really the solution. Most of the time agents are advising their client to make the home as easy to show as possible. And to declutter, and keep it as clean as possible. And they take into account the location of the home and supply and demand. You may have heard this before: In real estate, price isn’t always the problem, but it’s always the solution. Sure, a house could be worth every penny a homeowner is asking. It might very well be justified by recent comparable sales in the area. But price will always get a home sold. And if a home isn’t selling, it’s almost always due to the price not being appealing enough to overcome any of the above factors. It can overcome having strict showing times. If a homeowner wants to limit their house to being shown one day a week at a certain time… Fine. If you price the house aggressively, buyers will go out of their way to adjust their schedule. It can overcome clutter and messiness. It doesn’t matter how awful the house shows, or how smelly it is…if it’s priced appropriately for the condition. It can overcome supply and demand. If few homes are selling, and there are a lot of similar choices for buyers to choose from, a lower price will certainly make the buyers choice easier. As much as real estate agents are perceived as being pushy, most are not. And they get blamed for houses not selling — for expiring — when most of the time it’s because the homeowners they represented didn’t listen to their advice about pricing their home. Price takes into consideration every factor. Don’t be too quick to judge the listing agent for the lack of success. It’s more than likely due to a homeowner who isn’t listening to good advice, that would help them avoid these common issues, and get their home sold.